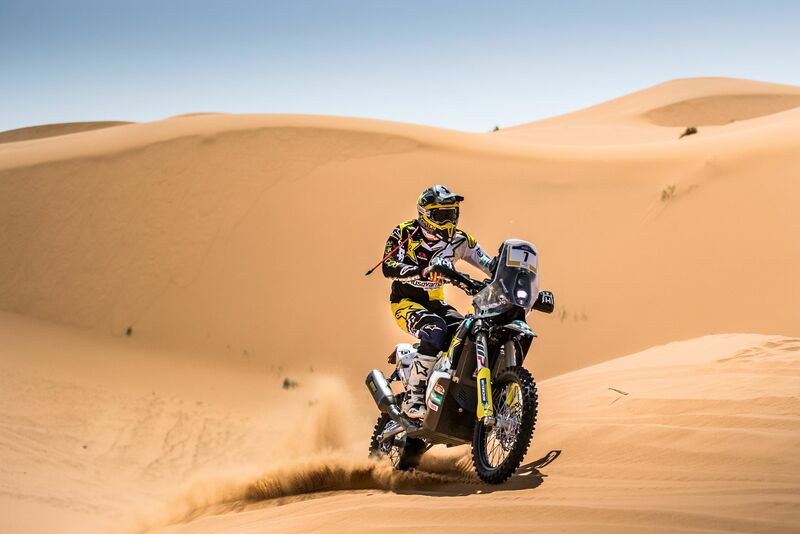 Determined to wrap up his week-long adventure in Morocco on a high, Rockstar Energy Husqvarna Factory Racing’s Pablo Quintanilla has topped the fifth and final stage of the Merzouga Rally to secure a solid third overall in the event’s final overall standings. Continuing to make progress Andrew Short has claimed a spot inside the top 10 in the overall. Featuring a mass, motocross-styled start in the dunes of the Merzouga Desert, the fifth and final stage of the event saw Pablo Quintanilla put in a dominant performance. Posting the fastest time for the day, the Chilean rally star solidified his strong third position in the overall standings. Putting in his best individual stage performance Rockstar Energy Husqvarna Factory Racing’s Andrew Short crossed the line in eighth position. Wrapping up the Merzouga Rally 10th in the overall, the American is content with the progress he made during the week in Morocco. The Rockstar Energy Husqvarna Factory Racing Team will return to action at the third round of the 2018 FIM Cross-Country Rallies World Championship, the Atacama Rally in Chile on August 11/19.